However, he has since graduated to a bigger bed…which required new bedding…and while I was at it, I decided his room was missing color, and elements that better reflect his personality. My design style, if I had to describe it, is an eclectic mix of colorful, vintage and updated traditional. 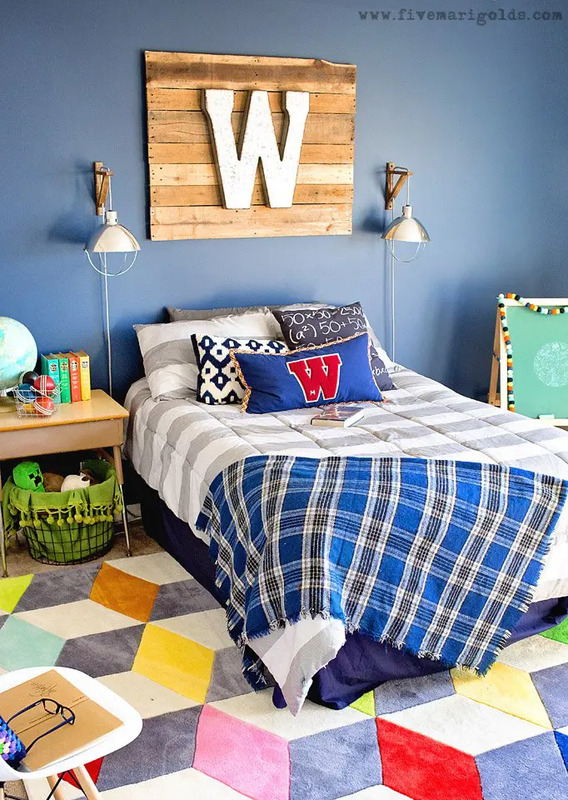 Today I’m going to reveal his colorful / preppy / rustic / vintage big boy room. 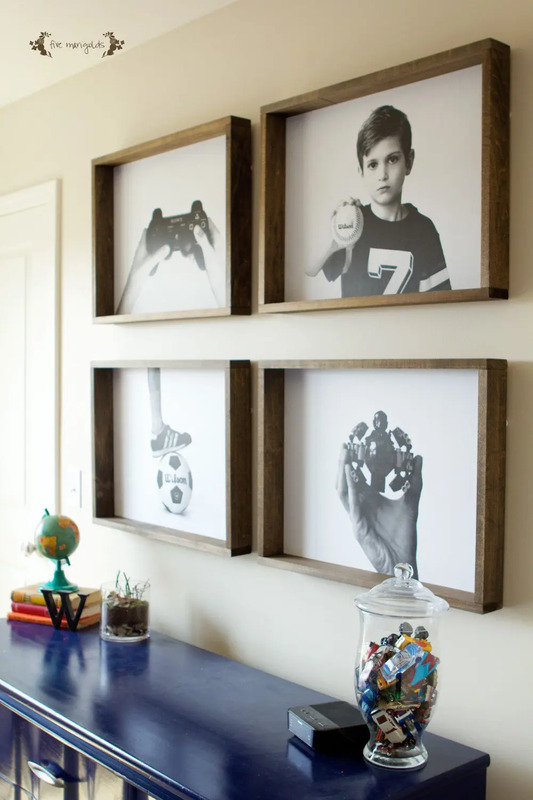 Engineer prints are a great way to design a boy bedroom, bringing custom touches through large photo prints on a budget. I’m very slowly beginning the process of decorating our new home, and focusing on the areas where inspiration strikes me the most. Dub’s room is the one I have the most concrete vision for, and I knew exactly where I wanted to start when I saw this idea for engineer prints for a boy’s room. I immediately set out taking images of the things most important to Dub. He loved being able to be a part of it in this way. I was able to order the engineering prints online by sending the images to the FedEx Kinkos copy store. I ordered 18×24 engineer prints. 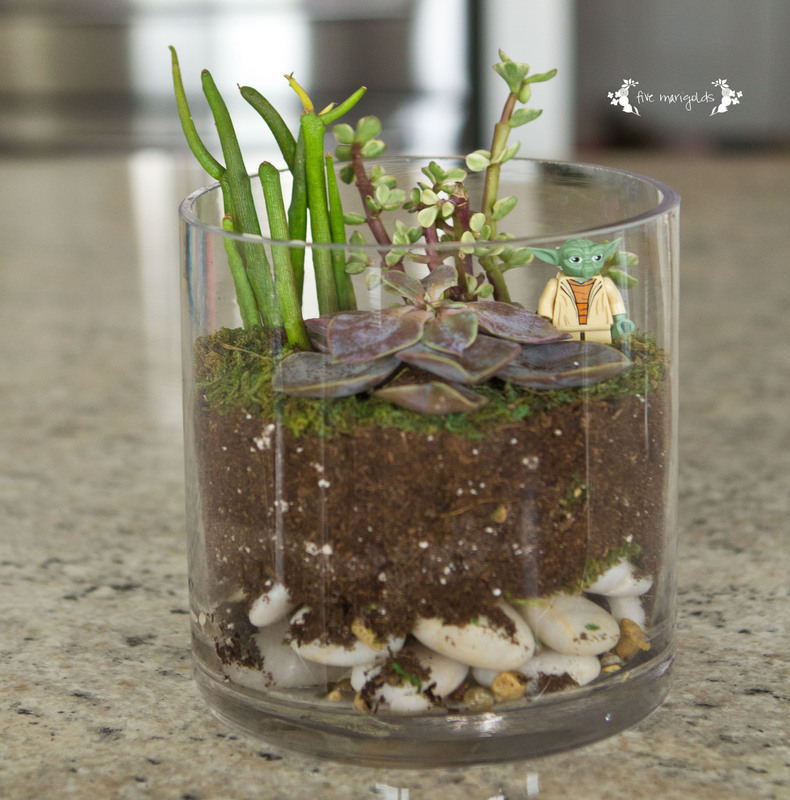 DIY open-air terrarium (or at our home, Yoda’s home on planet Dagobah). I’ve always been obsessed with terrariums, but was too intimidated to try my own. After I came upon some free supplies, I decided it was time to try my own open air terrarium as a special project with Dub. First, make sure your vessel and rocks are clean. Then, I placed the large decorative stones around the edge and filled the middle with the gravel for drainage. Cover the rocks with moss which acts as a filter. Next, cover the moss with as much soil as your plants need to build roots. We covered our soil with moss because we liked the way it looked, but this is optional. When you’re done arranging your plants, give it some water to set the soil and roots in place and continue watering just a bit each week, being careful not to over-water, which promotes rot. Once our terrarium was complete we thought it needed a little ornament. We thought it looked like Yoda’s swamp, so we added a little Yoda Lego man. 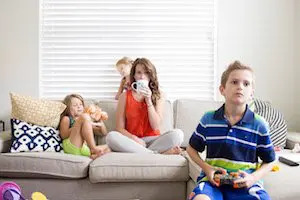 He fits right in, don’t you think? Overall, this ended up being incredibly inexpensive for me since we sourced everything for free except the plants and soil. This was a fun project to do with Dub. He was stoked about this project and excited to put the terrarium in his room!